H.P. Lovecraft was virtually unknown during his lifetime and only published his stories in pulp magazines such as Weird Tales and Astounding Stories. He died a recluse in poverty and obscurity, aged just 46. Consumed with self-doubt, despair and monstrous inner demons, his nightmares inhabit every page of his writing. He is now widely regarded as one of the most significant horror fiction writers of the twentieth century. His dark grotesque creations have inspired authors such as Stephen King and Clive Barker, as well as film directors John Carpenter, Stuart Gordon and Roger Corman. Eighty years after his death, Charlotte Montague has written an intriguing biography of the enigmatic author, and in the process helps to reveal the mysteries of the strange man behind the darkness—H.P. Lovecraft—the master of modern horror. H.P. 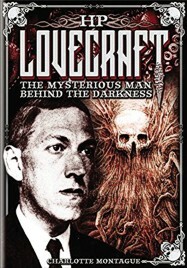 Lovecraft: The Mysterious Man Behind the Darkness. By Charlotte Montague. New York, NY: Chartwell Books; 2015; ISBN 978-0-7858-3269-0; hardback; 192 pages. This book may be purchased in hardcover from Amazon.com or Barnes & Noble or directly from the publisher, Chartwell Books.